The almost fifty-year old U.S. economic policy towards Cuba entails the embargo that is the topic of this essay. Indeed, not even on the naming of the economic policy can the camps agree. To those antagonistic to the revolution the policy is an embargo -- an economic sanction constituting a legitimate government action that legally restricts the flow of goods, services and capital to the island in order to try to influence the Castro regime into changing its undemocratic ways. Such lawful restrictions simply signal justifiable disapproval of another country's policy with the goal of changing the state's behavior that is perceived as a threat to the sanction-imposing state's national security or economic well-being. To those supportive of the regime, however, the U.S. action is a "blockade," an illegitimate use of power to try to make the state march to a different tune -- one not of its own sovereign imagination or desire. This essay will evaluate the embargo and its consequences in three parts. First, it briefly sets out the Human Rights framework within which this work scrutinizes the embargo. Following it presents a brief history of Cuba-U.S. relations including the creation and progression of the economic sanctions the U.S. has imposed on the neighboring island. 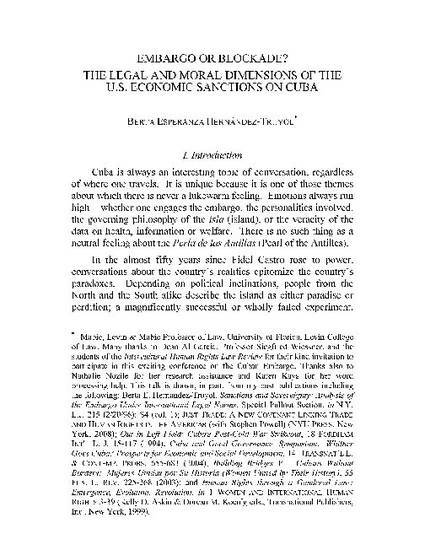 Next, the essay evaluates the legality of the sanctions and concludes with a critical analysis of the impact of the sanctions.